How DOES one come to know the truth? How DOES the truth set one free? Jesus tells us in verse 31-32: “…If you abide in my word, you are truly my disciples, and you will know the truth, and the truth will set you free.” Think about this, friends. How do you know that you are REALLY a disciple of Christ? Abide in the words of Jesus, obey them completely…and you really will be a Christian in the eyes of God (Matt. 7:21-27; Heb. 5:9; John 14:15, 23-24; 15:10, 14; 1 John 2:3-6; 5:3). But how does one abide in his word? That requires that one first know his word through daily study (Ps. 1:1-3; 1 Tim. 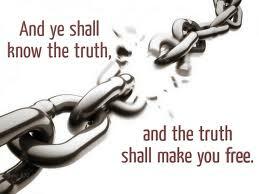 4:13, 15-16), which is how you will come to know the truth which will set you free from the slavery of sin (John 17:17; Rom. 6:17-18). Many disagree with this, thinking that all that is required of them for salvation is to believe in Jesus. However, notice that Jesus spoke these words to “the Jews who had believed in him” (v. 31a). Thus, faith by itself is not enough; it must be accompanied by works of obedience to the Word of God (James 2:14-26). Do you know the truth so it can set you free?